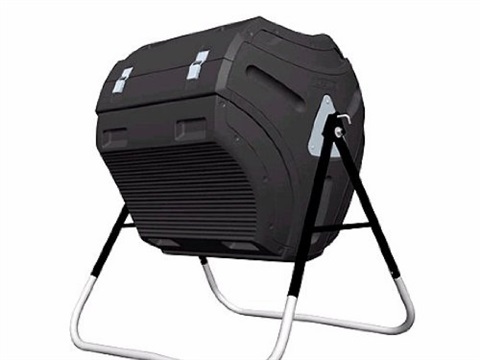 The operational part of a tumbler composter is a sealed drum like container that is rotated to mix and aerate the organic waste. 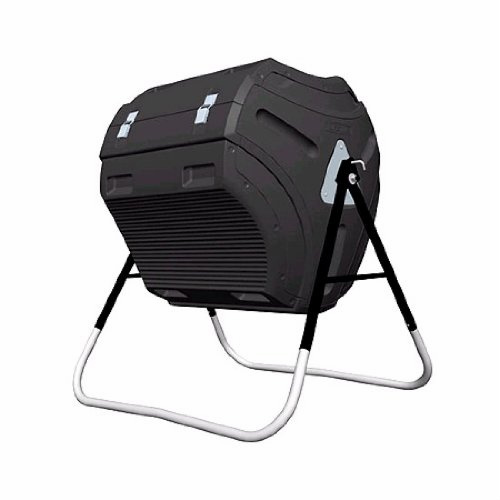 Compost tumblers are normally sold as a means of making compost more quickly and easily than would be achieved in a conventional compost bin. The use of a tumbler is designed to free the gardener from task of ‘turning’ the compost heap or material in the bin. 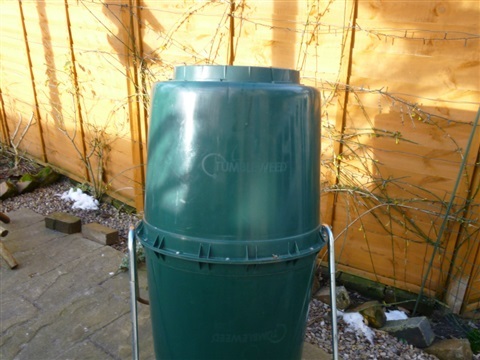 Those using a tumbler will no longer have to turn their compost heap to aerate and mix it with a fork, move it from one wooden bin to another or the mix the contents of a plastic bin where there limited space with an aeration tool. The advertisements for tumblers suggest that mixing the compost is under taken quickly and easily by turning the tumbler, speeding up the composting process by both providing through aeration and mixing the materials to ensure maximum microbial activity. It is claimed that correctly operated tumblers can produce compost in 6-8 weeks, with some sources suggesting 3 weeks is possible under ideal conditions. Mantis (in How to Make Superior Compost) http://mantis.com/global/assets/owners_manuals/compostumbler/scomp.pdf indicate that the time taken to produce compost can be reduced to 14 days. This uses a technique that completes the initial mesophlic, the thermophilic and the second mesophilic stages by monitoring the temperature and moisture content of the composting material daily. The moisture content is adjusted if it is to dry (by adding water) or by adding carbon rich material e.g. sawdust if the organic material is to wet. Frame mounted Tumblers also offer advantages if space is limited or where the only space available is hard landscaped e.g. concrete, slabbed or decking, as they do not need contact with the soil and can be mounted over a tray to catch leachate avoiding staining the hard surface. 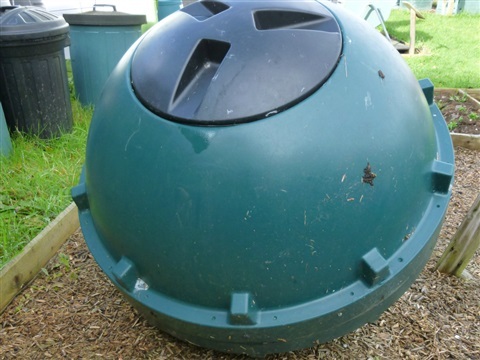 While the bins are sold on the basis that they are quick composters the time actually taken to produce compost will depend on the bin being rotated frequently, the mix of materials and temperature. In theory they should compost faster if the tumbler is rotated regularly, mixing and aerating the contents, but a conventional hot compost heap turned regularly will also produce compost quickly and you will have the satisfaction of having a steaming hot heap and bigger muscles. Traditional composters may take comfort that a trial by Which? Gardening magazine in 2011 compared turning 5 tumblers three times a week with turning a traditional compost heap of the same volume tumbler once a week. Surprisingly they found that, while the heap took around ten weeks, tumblers actually took a month longer to create usable compost. However turning an open heap or even the contents of a dalek bin requires more effort than turning a well-balanced tumbler and few gardeners will turn a conventional heap weekly which does undermine the test results. However I have met many tumbler users when giving talks who find that they make compost both quickly and with relatively little effort. 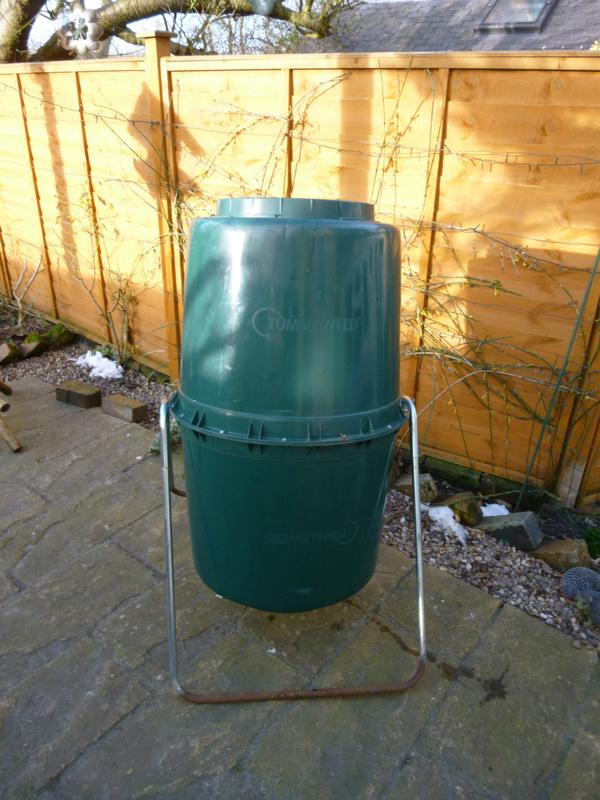 A tombola type tumbler is easier to turn than a barrel composter and those turned by a handle and cogs are even easier use. The use of a tumbler is therefore worth considering if you have a back problem which would be exacerbated by turning a compost heap or if you have a large garden. 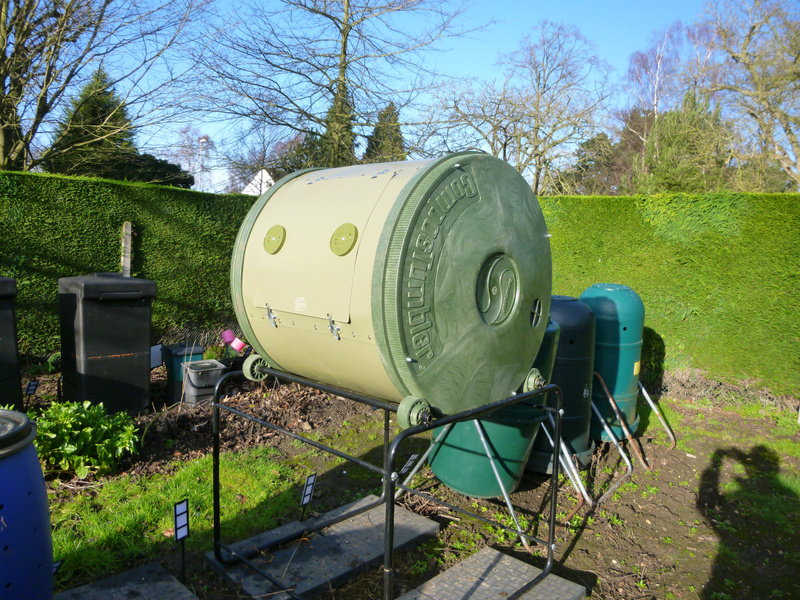 Some of the tumbler composters are supplied in a range of sizes. In the case of food tumblers, I would recommend that a food waste audit is carried out before ordering a composter so that the correct size is purchased capable of coping with the food waste produced. It should be borne in mind that the larger bins will probably be heavier to turn when full so there are advantages in seeing if you can try turning a full bin before buying. I have found that the effort of turning the barrel bin is often quoted as one of the reasons for abandoning the use of the barrel type tumblers. On the otherhand the larger tombola type of bin fitted with a handle and cogs can be relatively easy to turn. 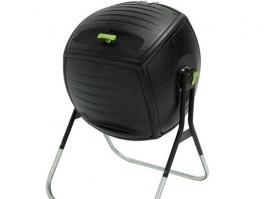 In the case of garden composters, most are designed as "batch composters". Compostable materials should be held back so that the bin can be filled to the correct level in one go. Under batch composting systems, with all the organic material being added to the bin at the same time and regular mixing, the materials in the bin will be at the same stage in the composting process and consequently should be ready at the same time. This avoids the need to to separate composted material when the bin is emptied to remove the more recently added uncomposted material as is necessary with thesyatems using conventional bin. Some tumblers such as the Jora have two chambers in the drum to allow the older material to mature while fresh material is added to the second chamber. With single chamber tumblers there are advantages in using running two units so that the first bin can be left to mature while the second is filled. An alternative to empty the tumbler into a conventional bin to allow the compost to complete the maturation stage while the tumbler bin is refilled. The tombola shaped bins make it easier to monitor the moisture content than the barrel shaped ones. As sealed (and insulated?) units tumblers retain moisture better than open heaps, so they do not need as much as with a conventional plastic bin. In the vegetable garden plant tops and peelings will probably provide an adequate source of moisture. Grass clippings might need to be composted separately by grass boarding. Occasionally the material may be to dry in which case add more greens or if near the end of the cycle add a small amount of water turning the tumbler to mix the contents after each addition until the correct moisture level is reached. Having mentioned that the C:N ratio is important when composting using a tumbler, and that 40-50% browns may be needed it may be surprising that some people recommend a tumbler as a means of dealing with relatively large quantities of grass. I would normally suggest that grass clippings are composted using the “grass-boarding” technique. As grass which is high in Nitrogen will, in a conventional bin, become wet and compacted, excluding air which will result in a black smelly mess as a due to anaerobic decomposition. However as a tumbler separates and mixes its contents every time it is turned introducing air it can be used to process grass provided it is rotated daily and a good supply of carbon rich materials are added. Monitor the condition of the compost added more Browns if the material becomes too wet and water if it appears to be too dry. The use of a sealed container mounted off the ground deals with the rat problem but it also means that worms cannot access the drum. 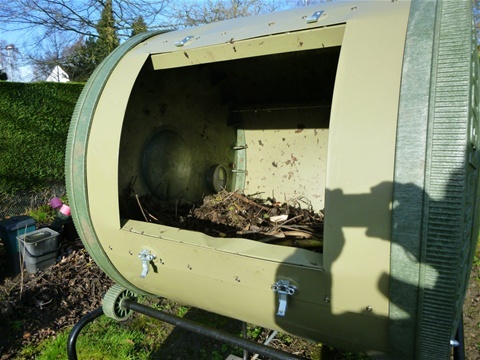 Introducing worms from a conventional heap is not practical as a quick composting method the bin will operated at higher temperatures and the worms cannot migrate back into the ground. Tumbler composters depend on the action of microorganisms, actinomyces, fungi and bacteria. However, the advantage of hot batch composting systems is that weed seeds and plant pathogens should be killed and worms will enter the maturation bin if the compost is left to mature in a convention bin after the initial composting process. In fact, at this point some people put it to one side in a bin or heap to continue the maturation process, which then allows worms to move in. If we accept that correctly used batch composting in a tumbler drum the organic material should heat up and pass through the "hot (thermophilic) stage" of composting more quickly than in a conventional wooden bin or heap (if only because we are less likely to turn the contents of conventional bins unless following a three or four bin hot composting system) the tumbler will produce composted material in a few weeks. The contents of a tumbler should also reach temperatures unobtainable in normal plastic bins killing pathogens and weeds. However whereas we might leave the compost in the bottom our Dalek bin for 6-18 months to mature we will need to empty the tumbler to make way for the next batch of material. This third maturation stage of the composting process is important. The bacteria and fungi, which live and work at lower temperatures, need to reoccupy the composting material and convert the heavier and woody materials that have not completed the composting process to produce rich friable compost. Maturation can be completed by tipping the material from the tumbler into a heap or transferring it to a conventional plastic bin for about 6 months. Alternatively, the maturation stage can be avoided by using the material straight from the tumbler as mulch on the surface of the garden. 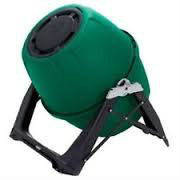 Compost tumblers are available in three basic forms. I have found that the speed of decomposing varies with the type of tumbler bin as in practice the ease of rotation (see above) will play a major part in determining the frequency with which the bin is turned and aerated once the novelty of having a new bin wears off. At the Compost Corner the Snibston Demonstration site, we have found that the barrel type of bin can be quite heavy to turn when in use which means that people do not turn it! On the other hand, the Jora “tombola” style is very easy to turn and is spun regularly by small children. These consist of a vertically mounted barrel or drum which rotates on a central, horizontal metal axle. The axle is mounted on a metal, wood or PVC frame. 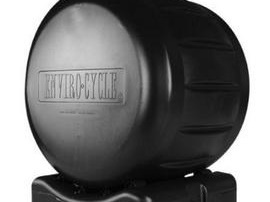 As a rule the plastic drum is made out of recycled plastic but at least one company reuses drums which have previously used by industry thus saving the energy which be used in the recycling the plastic in. When the bin is turned and the contents tumble inside the bin the central axle breaks up and mixes the contents. It is worth checking that the lid is correctly in place before spinning the bin. In my experience the older bins of this type are one most likely to be sitting in a corner of the garden neglected because the gardener could not get on with it. Having said that I usually find that in a group of 50-100 gardeners in a Garden Club there will be one or two who get on really well with this type of bin and use them to produce compost quickly and efficiently. 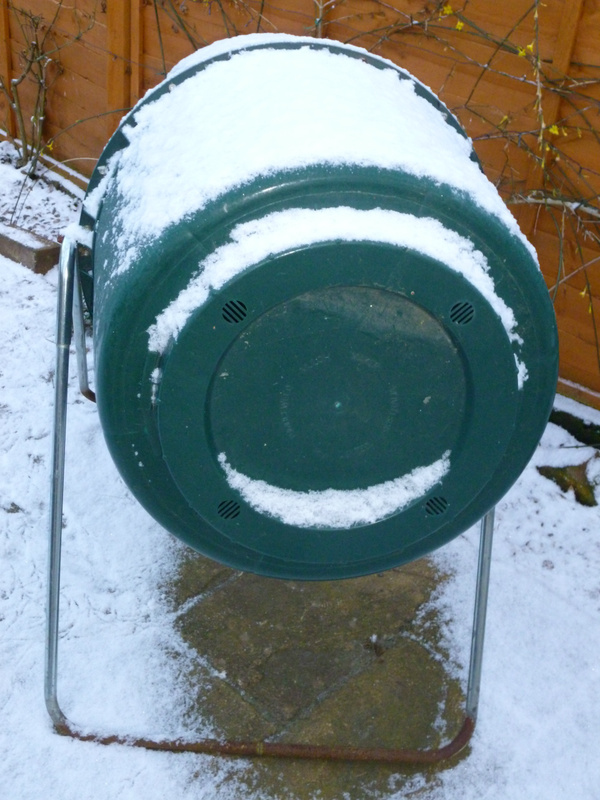 One of the gardeners also report success in using this type of bin to produce leaf mould in the autumn. It is also a good idea to save the compostable material and fill the bin all in one go (batch composting) as the compost needs to be at the same stage of decomposition, as it will all be tipped out at the same time. 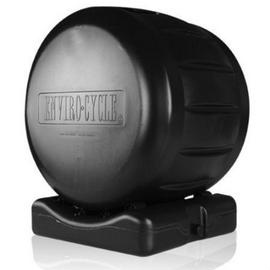 While Barrel Tumblers are neat in appearance and resistant to rats and other pests do consider the storage of the material prior to composting and while it matures at the end of the tumbler process. The different makes of tumblers are mounted at different heights and if possible, it is better to get one that can be emptied directly into a wheelbarrow, otherwise they can be empted onto a sheet of polythene and contents shovelled into a barrow. A horizontally mounted drum rests on a raised framework and look like a large tombola drum. The drum can be either free spinning or Crank-operated. In the later case, a crank assembly is provided to turn the drum relatively easily but this may be slower than the free spinning models. The drum may consist of a single or double chamber, and will normally have internal baffles help mix the materials. With the twin-chambered models, material can be starting the maturation process in one chamber while fresh material is added to the other. However, a separate maturation bin is recommended for maximum production and to make best use of the speed at which the material is broken down. They may have sliding or hinged doors. The drums are mounted on a frame and this needs to be of a height that will enable a wheelbarrow to be placed under the drum and the compost emptied directly into it. Some models are supplied with frames for wall mounting. Round or horizontally shaped drum design to be rolled on a ground-level base quite widely advertised. Depending on price and style, these may be mounted on rollers, or have moulded raised points to suspend the drum so that it can rotate on the base. The type with rollers in the base require less effort to turn. 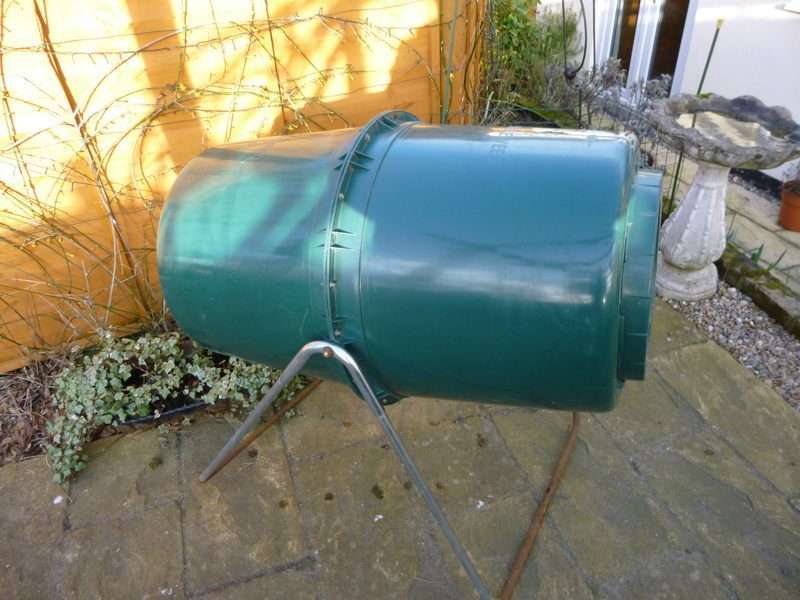 Depending on the size of the composter, it may be necessary to bend to turn it and emptying has to be undertaken using a spade. These are often sold for smaller gardens. 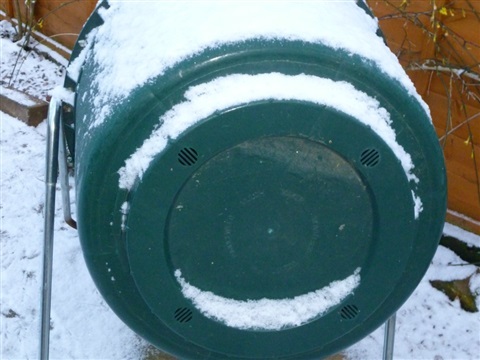 However if the drum can be rolled of its base it can then be rolled to the part of the garden where the compost is required. 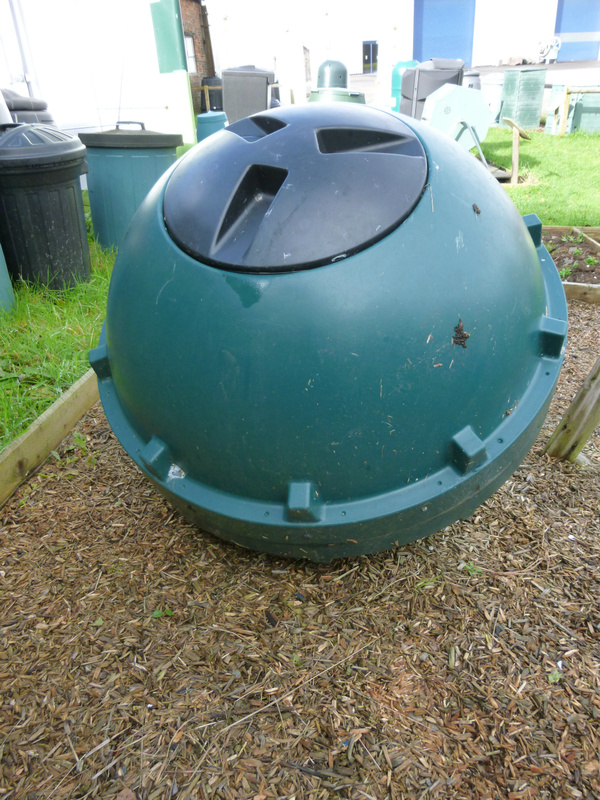 Roll-Around Sphere or Barrel Compost Tumblers. Said to be easy to turn even with a full load. This model turns on its axis for easier rotation. Wheel mounted drum . This model also collects leachate in the bottom which can be used as a liquid feed.fertilizer of it's own! 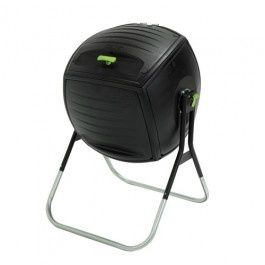 Mantis supply tombola style composters rangling from 140 litres capacity, for smaller gardens where space is limited, to a double bin composter with a total capacity of 700 litres.